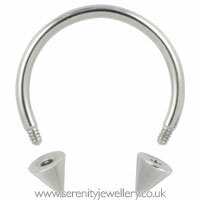 Hypoallergenic 316L surgical steel spiked/coned circular barbells with 8mm or 10mm internal diameter. The circular barbells are secured at each end by 3mm screw-on cones. 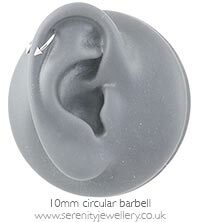 1mm or 1.2mm gauge circular barbells? 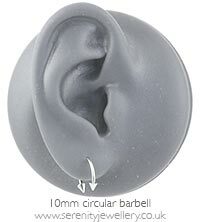 1mm/18 gauge circular barbells are good if your piercings have shrunk or were originally pierced with a smaller size. They are not compatible with the screw-on accessories which are 1.2mm gauge. 1.2mm/16 gauge is the most common size ears are initially pierced with. 1.2mm gauge spiked circular barbells are compatible with a large range of screw-on accessories and spares.